Traditional-style kitchens are sophisticated and classic. Traditional design incorporates architectural features from the European Old World countries, Mexico and colonial America. Elegant craftsmanship, embellishments and refined details are important. 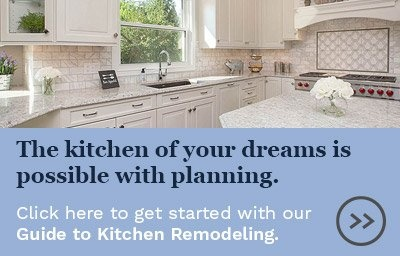 If you love the look of a traditional home, here are six design elements to consider in planning a kitchen remodeling project. “Country French” is a Traditional-style kitchen that combines a mix of wood and stone elements. This kitchen features three different types of cabinets that work together. Finishes include cherry, maple and white. 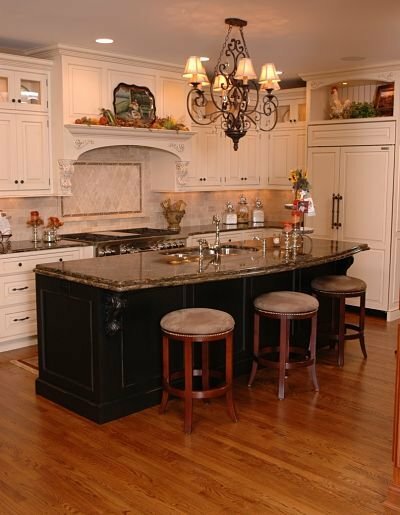 Two types of granite were used to complement the cabinets. 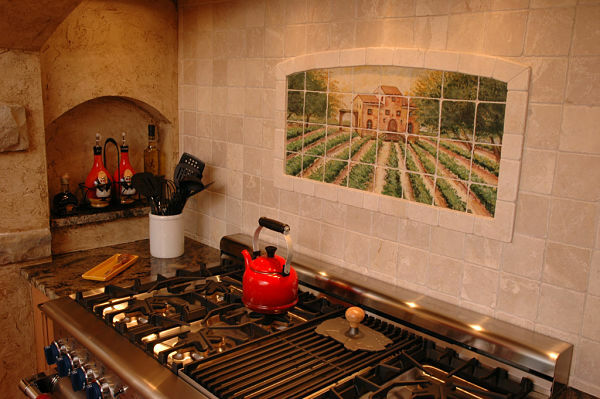 There is a stone veneer on the cooking arch and a tile fresco of a French vineyard. Cabinets are the most prominent element in a kitchen and define the style. Furniture-style cabinets are used in Traditional-style kitchens. Cabinets may have mortise and tenon or mitered door panels, glass door inserts, applied moldings, carved trims and corbels or wood appliqué embellishments. Stain and paint finishes are rich in both color and texture. Cabinet doors can be used to integrate dishwashers and refrigerators into the room. Cabinetry can also be used to frame a vent hood over a cooktop or range. An elegant Traditional-style kitchen with mitered panel doors, glass inserts, corbels, crown molding, carved embellishments, granite counters, a wrought iron and crystal chandelier and wood flooring. 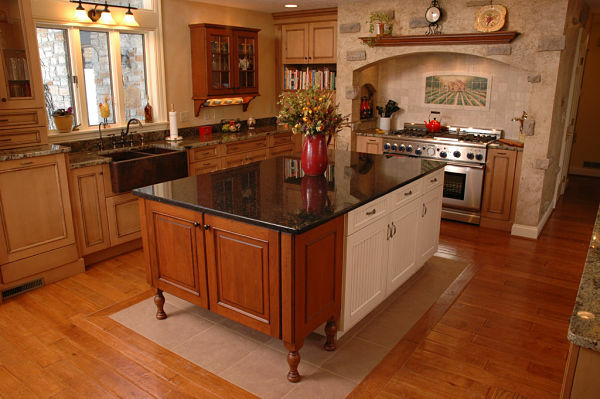 Natural stone or more recently quartz countertops are used in Traditional-style kitchens. 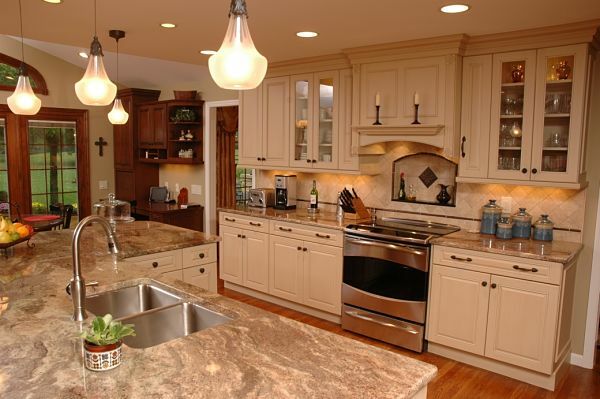 Popular stone countertops include granite, marble and soapstone. The edging of the stone adds an important element to the room. Ogee, bevel and bullnose edging add elegance while waterfall or straight edging creates a clean look. The counter shape is also important to consider. Countertops can be curved or tiered on an island or peninsula. Two styles of cabinets and granite were used in this Traditional-style kitchen. The counters have ogee edging and the granite on the island was cut into a shape expressly designed for the kitchen. 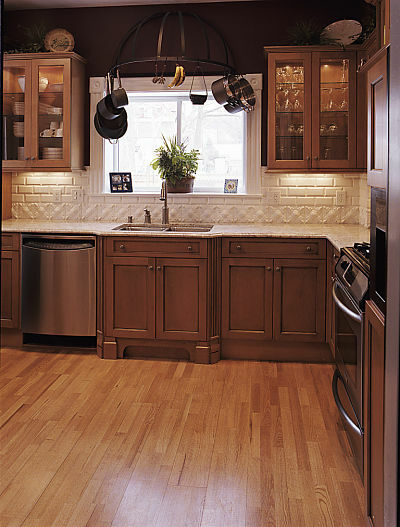 Cabinet hardware gives a Traditional-style kitchen a distinctive look. There is no rule of thumb. Hardware can be uniform throughout or matched to cabinetry for example, using glass knobs to accentuate a cabinet door with a glass insert. Hardware finishes can also be mixed or matched to accent tile. Oil rubbed bronze finish pulls were matched to the accent tile in this kitchen. The shape of the pull also complements the fleur de lis design of the inset tile. 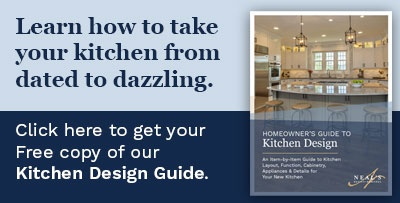 Kitchen lighting is both practical and aesthetic and can set the mood. 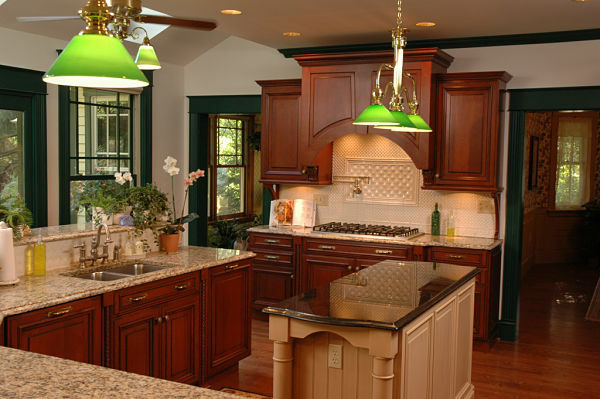 There are many light fixtures that will add to the style of a traditional kitchen. The shape and type of shade used on a fixture are important details as is placement. Lighting should be planned strategically to illuminate work areas, provide general lighting and add ambiance. If you plan to use a hanging fixture, consider the advantages and disadvantages of uplights and downlights. While a downlight fixture can provide direct illumination of an area it can also create glare. An uplight fixture provides more diffuse illumination but may not be bright enough for task areas. The lighting in this stunning kitchen is “traditional with a twist.” Teardrop pendant fixtures were used to illuminate the island. Recessed lights provide general lighting. Task areas near the range are lit by under-cabinet lights. Puck lights in the glass door cabinets display the contents and add ambient light to the room. Molding, trim and appliqués are essential details in a Traditional-style kitchen. Molding includes ceiling, cabinet, window and door and floor trim used in the room. Molding strips can be combined to create an elegant look. 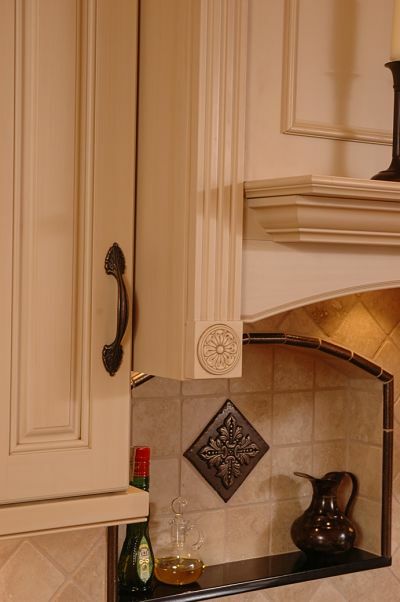 Corbels and appliqués can be used to accentuate cabinets and a range area. The crown mold at the top of the cabinets and the carved molding used on the base cabinets add architectural interest to this Traditional-style kitchen. The white carved molding surrounding the window complements the texture of the white tile used for the backsplash. Corbels and carved moldings frame the backsplash behind the range. Tile in a kitchen can be practical but it can also be a personal design statement. 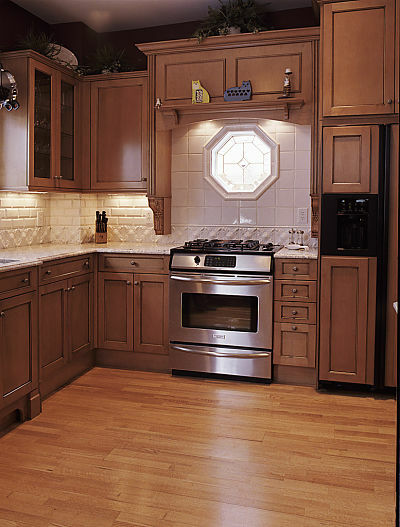 Tile is a focal point in a Traditional-style kitchen and accents cabinets and appliances. It is helpful to work with a kitchen design professional in planning a tile design. Off-white tumbled marble tile in a grid pattern provides a field to frame a hand-painted ceramic tile mosaic scene of a vineyard.